The very first teddy bears were made over 100 years ago. These weren't soft toys but wooden and clockwork, sometimes pulled along on a string. 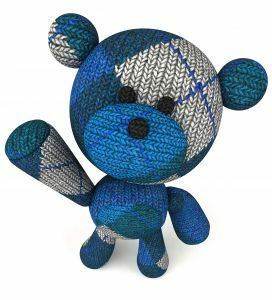 Teddy Bears as we know them originated in Germany and the U.S.A.
President Theodore 'Teddy" Roosevelt refused to shoot a bear in an unsportsman like way. This event was made famous in the press and cartoons were the result. A shopkeepers wife made a teddy bear and put it in their shop window next to the cartoon and called it 'Teddys' bear. 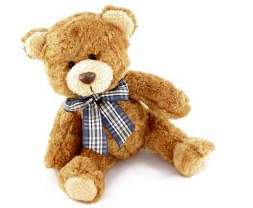 This bear became quite famous and the Ideal Novelty and Toy Company was founded. A few years earlier in Germany, Margaret Steiff used her offcuts from her sewing business to make animals including teddy bears. 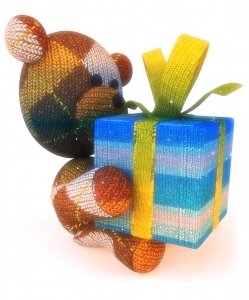 The Felt Toy Company was founded in 1893 and started making mohair bears with moveable joints. A New York department store ordered thousands of these bears. It was perfect timing as it was around the time of the Roosevelt incident. The first bears were designed by Richard Steiff who was Margarets nephew. The Steiff bears has a button placed in one ear, which they still do today. During the first world war (1914-1918) German bears became scarce, so teddy bear making took off in England. Then later on in other countries. The time between the two world wars was when teddy bear making really took off. 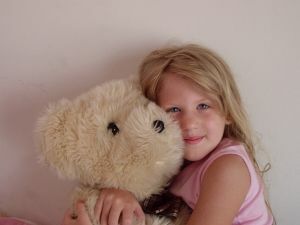 Films, cartoons and books about teddy bears became very popular and teddy bears started to be mass produced. The Panda bear became popular after China gave Chicago Zoo a panda in 1937. After the Second World War, everything was in short supply so teddy bears started to be made from man-made fabrics with softer filling. This made them much more affordable. 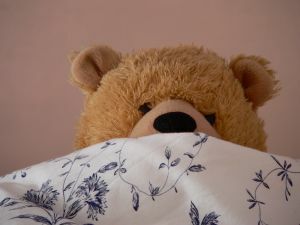 Teddy Bear sales declined in the 1960's and 1970's but recovered in the 1980's. Teddy Bear collecting has become very popular, and there are some very old bears out there worth an absolute fortune. Most large towns and cities have craft shops that sell bear-making supplies. Supplies are also available by mail-order of over the internet. Acrylic fur fabric or mohair. It's best to use acrylic if your new to bear making as mohair is quite expensive. It's best to sew the noses using the embroidery thread rather than using plastic noses. It takes time to perfect but the outcome is worth it. Eyes are available in plastic or glass. Plastic eyes are safety eyes and it's best to use these if the bear is for a child. Glass eyes are available in many colours and are absolutely beautiful. I prefer to use these on a mohair bears for adults and collectors. There are different sizes and types of joints available. Each bear needs 5 sets of joints. Wooden joints need to be joined with either bolts and locknuts or cotter pins. Polyester stuffing is the most popular. Collector bears need to be stuffed more firmly than toy bears. The pile of the fur needs to go down the bear. First of all, trace the pattern onto paper or cut out the pattern if you can. Then glue the pattern pieces on to cardboard (cardboard from cereal packets will do). Make sure to transfer the arrows and other markings onto the pattern if you have traced it. Place the pattern pieces onto the wrong side of the fabric with the arrows pointing down the pile. Make sure that you have enough fabric for all the pieces, remembering that you'll have four lots of legs and arms. If you are happy with the placement of the pattern, draw around the pattern with the felt pen. Then remove the templates, making sure to transfer the markings for the joints and eyes etc onto the back of the fabric. Cut out the pieces using the small pointed scissors. Use small snips and try not to cut the pile, just the backing fabric. This takes time! After cutting out, pin the pieces together right sides facing. Tack, making sure that no bits of fur our sticking out of the seams. Stitch the paw pad to the short arm before tacking the arms together. Back stitch is used to stitch all seams, Don't forget to leave a gap in each part so that it can be stuffed. Some bear makers like to sew by machine, but you have to be careful that the fabric doesn't slip. Fasten off the stitching strongly so that it doesn't come loose. After stitching the head parts together stitch around the neck opening and pull tightly, fasten off securely. Then stuff the nose area firmly. Stitch the nose and mouth using the embroidery cotton. Sew the leg parts together then pin the foot pads into position before tacking and sewing. Turn the legs the right way and push the awl through the marked spot inside for the joint. Do the same with the arm joints and then push the awl through the joint marks inside the body. The teddy bear can now be assembled. Fasten the joints together by lining up the holes in the limbs and the body. Push the joints through from the inside of the body (making sure that the washers are used) into each limb.The joints need to be very tight as they loosen after stuffing. Once the arms and legs are joined, tack around the neck opening and pull together and secure tightly. Using the holes in the head and body push the neck joint through to secure the head to the body. Teddy is now joined together. Next thing to do is to position the eyes. I like to use coloured head pins to decide where to put the eyes. Safety eyes go in before the stuffing. Glass eyes are stitched on after stuffing. Now it's time to stuff teddy. Using the wooden stuffing stick, use small bits at a time. I like to stuff the limbs first, then the head and body. Make sure that you stuff firmly. If you are happy with the stuffing you can now close the seams using ladder stitch. After stitching the ears together, turn out the right way and stitch across the bottom seam. Place on head in desired postion and stitch on firmly, sewing aroung both sides of ears. Congratulations, you now have a beautiful teddy bear.